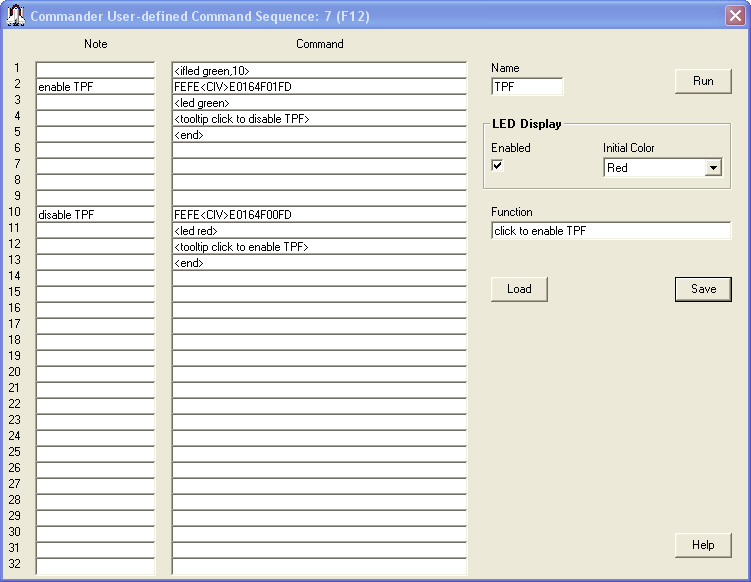 Each Command Sequence can optionally display a "LED-like display" beneath its button, and specify this LED's color. If you specify Command Sequences or Command-generating Sliders, and are controlling more than one transceiver, you must specify a User-defined Control Set for each transceiver. An Initial Command Sequence can be optionally executed when Commander starts, or when a new radio Model is selected. To define, edit, or test this sequence, click the Edit button in the Initial Command Sequence Panel on the Config window's General tab. Note: if you wish to include the ampersand character in the name, use a pair of back-to-back ampersands, e.g. R&&B. Function describes the function of the Command Sequence; this information will appear in a popup explanation window when the mouse cursor lingers above the associated Command Sequence button if the display of control explanations is enabled. an even number of hexadecimal characters, e.g. execution proceeds with the following command. a sequence of ascii characters preceded by a single apostrophe, e.g. will QSY to the most recent 20m frequency and mode, and clear Split. <DataSignalsEnable Off> <DataSignalsEnable On> checks the Parallel Port Data Signals panel's Enable box, thereby enabling frequency-based control of the parallel port data output. <DataSignalsEnable Off> un-checks the Parallel Port Data Signals panel's Enable box, thereby disabling frequency-based control of the parallel port data output. When the value of the Parallel Port Data Signals panel's Enable box is changed by either of these commands, the new Enable box setting is not saved in the Windows Registry. execution of the Command Sequence terminates. <FreqDepDevEnable Off, N> <FreqDepDevEnable On, N> enables Frequency-dependent Device N, where N is a number the range of 0 to 3. <FreqDepDevEnable Off, N> disables Frequency-dependent Device N, where N is a number the range of 0 to 3.
execution proceeds with command N.
the comparison between button caption and name is case-independent. the comparison between the current primary transceiver's name and name is case-independent. <Wait> pauses for the duration indicated in the Command Interval textbox after executing the previous transceiver command in the sequence before executing the next transceiver command in the sequence. The Save and Load buttons enable you to save a Command Sequence to a specified file, and load a Command Sequence from a specified file. If you are controlling multiple primary transceivers, you can define a user-defined control set that specifies the Command Sequences to be loaded when you switch among primary transceivers. Substitution strings let you insert the value of a command-generating slider, CI-V address, or ascii character into a specified position within a radio command. S means "signed decimal digits"
B means "unsigned binary bytes"
N is an optional digit indicating the Number of decimal digits (including the sign in a signed decimal format) or hexadecimal bytes to insert; when not present, a single decimal digit or hexadecimal byte or binary byte is inserted. For unsigned binary bytes, N is limited to the values 1 or 2. 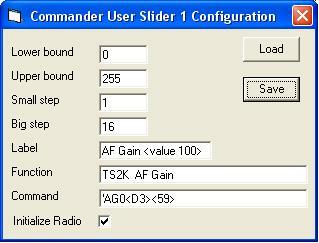 For example, the command FEFE6EE01401<2D4>FD will use the current value of slider 2 to set an Icom 756 Pro III's AF gain. The S is only optional when the substitution string appears in the Command of a command-generating slider's Configuration window; in this case, the slider's own value is used, as shown in the screenshot in the section below. The substitution string <CIV> is replaced hexadecimal radio commands by the current transceiver's specified CI-V address. Thus, the command FEFE<CIV>E01401<2D4>FD will be executed by the transceiver whose CI-V address is specified in the Radio panel on the Configuration window's General tab. When controlling a Flex Signature transceiver, the substitution string <FlexSigPanStream> is replaced by the hexadecimal ID of VFO A's panadapter. 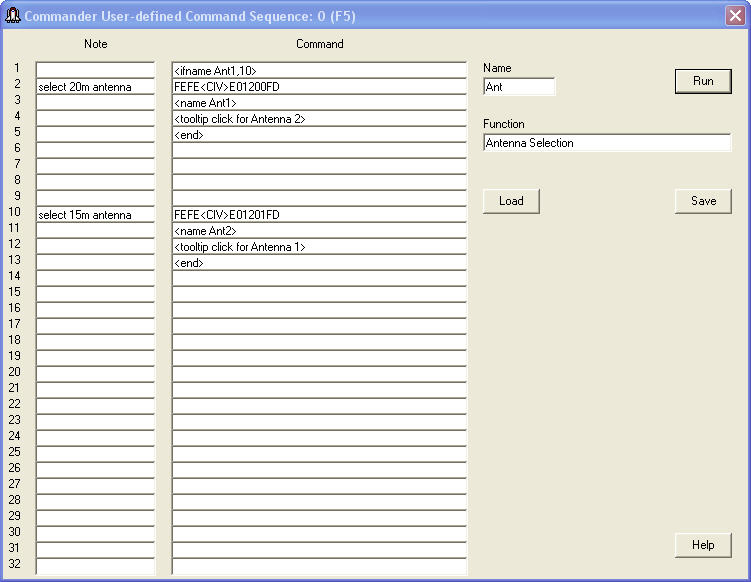 This ID is required by some of the commands used to control a Flex Signature transceiver. The substitution string <n> (where n is an integer between 0 and 127) is replaced in ASCII radio commands by a single character whose ascii value is n; for example, <13> will be replaced by the "carriage return" character. receiving a directive from another application (e.g. WinWarbler). In the example shown in the above screenshot of Commander User Slider 4's Configuration window, the ASCII command AG0000; will be generated when slider 4's handle is moved to the extreme left, the ASCII command AG0255; will be generated when slider 4's handle is moved to the extreme right, and the ASCII command AG0128; will be generated when slider 4's handle is centered. Note that while the CI-V commands used to control Icom transceivers are expressed in hexadecimal, variable settings must often be expressed in decimal. For example, the template used to control an Icom 756 Pro III's AF gain with slider #2 is FEFE6EE01401<2D4>FD (with a lower bound of 0 and an upper bound of 255) . In contrast, using slider #5 to select a Yaesu FT-1000MP's mode would be accomplished with 000000<5H>0C (with a lower bound of 0 and an upper bound of 11). Only the signed decimal and hexadecimal formats should be used with sliders that can take on negative values. For example, the FlexRadio template 'ZZWB<1S4> will generate commands like ZZWB+028 or ZZWB-014 . Commander's 16 sliders are numbered 1 through 16 and organized into two banks of 8, which each bank containing two rows of 4 sliders. The same ALT checkbox that switches between banks of Command Sequences also switches between banks of sliders. When clicked, the Save button saves the slider definition to a file you specify; the slider definition includes the slider's current value. The Load button loads the slider definition from a file you specify and sets the slider to the value saved in the file. If you are controlling multiple primary transceivers, you can define a user-defined control set that specifies the Command-generating Sliders to be loaded when you switch among primary transceivers.